Yeah, it’s sitting on every bench, in every court house in the country. 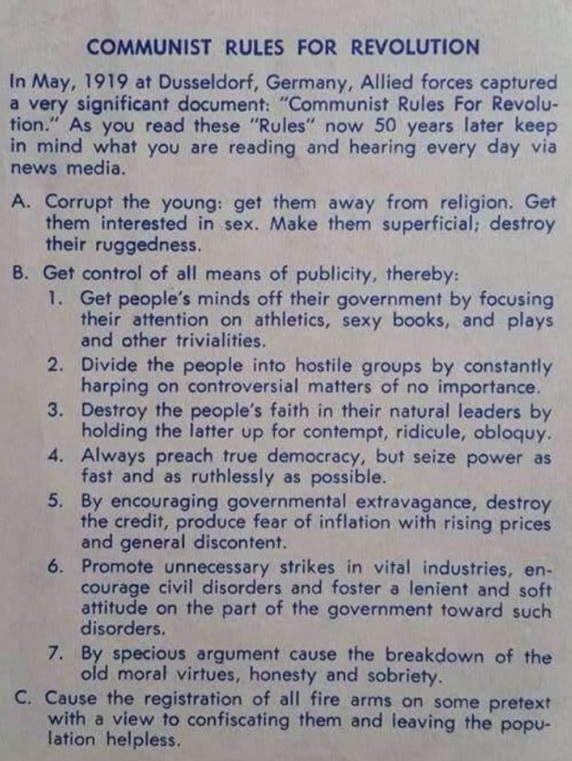 These old documents, like the Protocols of Zion, The Thirteen Planks of Communism (which I believe this is an excerpt from), provide their own proof of the communist (Zionist) conspiracy because everything they planned has been enacted, and enacted by Zionists. They can’t be dismissed as conspiracy theory or anti-Semitism because time has proven their credibility. The document was ‘captured’ (it probably put up a helluva fight) in GERMANY. From all that I’ve read, Hitler ONLY disarmed the communists & jews. This document was the main reason why, no doubt. Yep, I agree on your view of Hitler’s disarmament process. German nationals were all well-armed (the ones who could afford to be, anyway). Hitler didn’t have a problem with that, apparently.